Ornythology — Gamut Music. Inc.
Ornythology is a program of music from the courts of Elizabeth I and James I featuring well-known music arranged for lute quartet. These familiar pieces are heard here with the intricate interplay of four instruments, giving a new appreciation of the beautiful complexity in the tunes and polyphony that characterize the English Renaissance. The recording features instruments made by Grant Tomlinson and natural gut strings from Gamut Music. If you will be in Boston for the early music festival, please come to the Ornythology release concert on Wednesday, June 14 at 11:00AM. The concert will take place at the Old South Church, 645 Boylston St, Boston. One of few professional lute ensembles today, the Venere Lute Quartet is named after the Italian Renaissance luthier Vendelio Venere, who (like Antonio Stradivari) was regarded among the finest luthiers of his age. Members of the Quartet are busy lute professionals in four of America’s leading early music centers (Boston, New York, Chicago, and Minneapolis) who share a love of ensemble playing, lute scholarship, and audience education. Longtime friends, they began playing together while teaching at Lute Society of America Seminars. Instrument makers and musicians of the Renaissance were highly influenced by the theoretical and philosophical ideas attributed to Pythagoras, such as the relation of pitch to the length of a vibrating string and the belief that the “symphony” of sounding numbers in music expressed the orderly workings of the universe. Indeed, for many humanists of the Renaissance, the harmony of the universe was most clearly revealed in the well-tuned, well-played strings of the lute. The exquisitely crafted “family” of Renaissance lutes on which the Quartet performs are all strung in gut and modeled after instruments from Venere’s workshop by Canadian luthier Grant Tomlinson. The Quartet’s set of soprano, alto, tenor, baritone, and bass lutes is sized according to Pythagorean proportions; that is, in relation to the vibrating string length of the bass lute, the tenor lute is three quarters as long and tuned a fourth higher (4:3), the alto lute is two thirds as long and tuned a fifth higher (3:2), and the soprano lute is half as long and tuned an octave higher (2:1). In addition, the ensemble performs entirely on natural gut strings produced by Gamut Music, Duluth, Minnesota USA. The Venere Lute Quartet performs a wide range of Renaissance and Baroque music, and is actively expanding the lute ensemble repertoire with its own arrangements. Venere’s work also provides opportunities for today’s composers to explore the unique sound of the lute ensemble, while editions of the Quartet’s arrangements encourage student, amateur, and professional lutenists to keep the intabulation tradition alive. "The music on this disc is by men who worked at the English royal court from the time of Henry VIII (d. 1547), through the reigns of Henry’s children Edward VI (d. 1553), Mary I (d. 1558) and Elizabeth I (d. 1602/3), to the reign of Eliza- beth’s successor James I (d. 1625). Four of the men were Gentlemen of the Chapel Royal, a body whose dual purpose was to serve the religious needs and enhance the splendour of the reigning monarch." So begins the detailed, scholarly notes written by John Harley, author of "The World of William Byrd: Musicians" and "Merchants and Magnates and William Byrd: Gentleman of the Chapel Royal", written for this recording package. This recording will take you on a journey through some of the best music of the time and tickle your fancy with an interesting stereo image putting the treble lute on your left, the bass lute on your right and the tenor and alto lutes in between them. This recording technique allows you to sit audibly within the group so that you can truly appreciate the intricate interplay of the instruments. 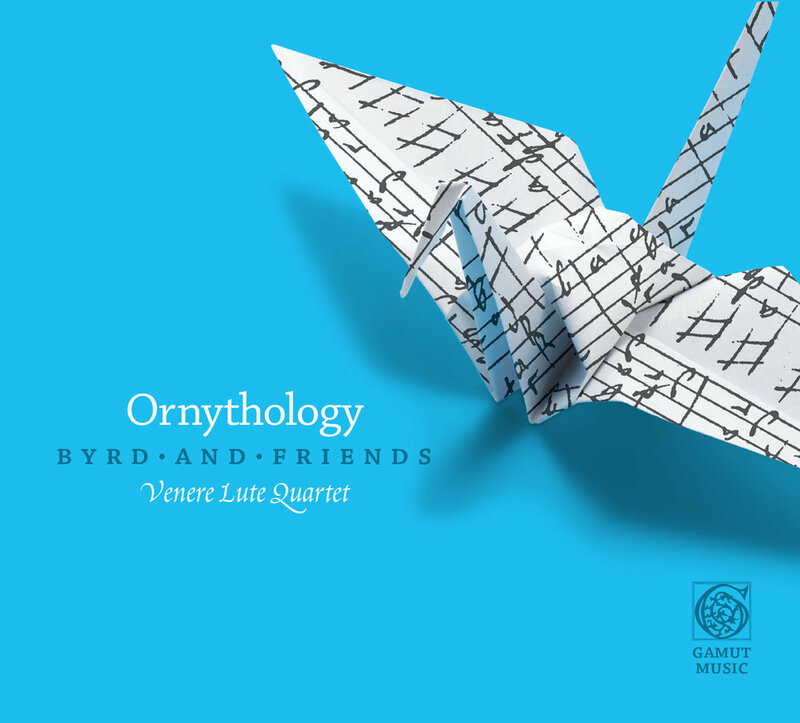 Above is a video explaining the store of the Ornythology program and the Venere Lute Quartet. Click on above image to change slides.